Discussion in 'Disney Pin Discussion' started by starry_solo, Jan 2, 2019. So, as we enter a new year, it's time for a new thread for PTDs. 3/8/19: Flynn from Tangled (LE400), Kermit from The Muppets (LE400), Madame Mim as a Snake from Sword in the Stone (LE400). Flynn sold out on 3/8/19. Madame Mim sold out on 3/11/19. Kermit sold out on 3/16/19. 3/22/19: Chip from Rescue Rangers (LE200), Figaro from Pinocchio (LE300), Mulan (LE500). Chip and Figaro sold out on 3/22/19. Mulan sold out on 3/24/19. 3/28/19: Boris from Lady & the Tramp (LE300), Cruella De Vil from 101 Dalmatians (LE400), Grandma Tala from Moana (LE400). Grandma Tala and Cruella De Vil sold out on 3/30/19. Boris sold out on 4/9/19. 4/15/19: Felicia from Great Mouse Detective (LE400), Goofy from Disney Classics (LE300), Bob Parr from The Incredibles (LE300). Goofy sold out on 4/16/19. timeerkat, Kerri780 and ItzaPinfan like this. Do you know who's doing 2019 pin pickups? I've been looking but no luck. Funny you should ask...I just reopened my pickup thread earlier this afternoon. As far as I know both Evinrude and Aliens are still available. Vixy, starry_solo and Ajk like this. I purchased the last Evinrude tonight, so it’s down to just the Aliens. I stopped by to get a few pins for my pickup thread, and supposedly I got the last Aliens. There’s a chance more bags were in the back but I definitely got the last one on the drawers. Dominik, pretty Omi, tiggeriffic and 1 other person like this. Hopefully the next PTDs will be a bit better! *bangs head against desk* I was working from home for a large part of yesterday and could have stopped by to get these then. They seem to constantly release things *just* before or *just* after I am available to go. Well, they are LE400, so *maybe* something will be left beside Fflewddur when I can get over there tonight. pincrazy, TiggerSue and watzshakinbacon like this. LadyBarclay, pincrazy and timeerkat like this. Wow the 1 day this week that I not only didn’t get off early, but have to work overtime DSF decides to release the 1 character I collect as a PTD. Unbelievable. Hopefully he’s still there when I’m done. TiggerSue and watzshakinbacon like this. Man, they are just out to get you guys, aren't they? Wow no line when I got here (like 5 min ago). I was able to get a stitch for myself! I can do a tigger or other PTD pickup for $25 shipped to US ONLY. Edit: offer expired. Leaving now! timeerkat and stitchismyspiritanimal like this. Wow no line when I got here (like 5 min ago). Sorry I should’ve clarified that I got stitch for myself. And “other PTD” was the other one.. the one I can’t remember. Ah, I thought my validation didn't go through! 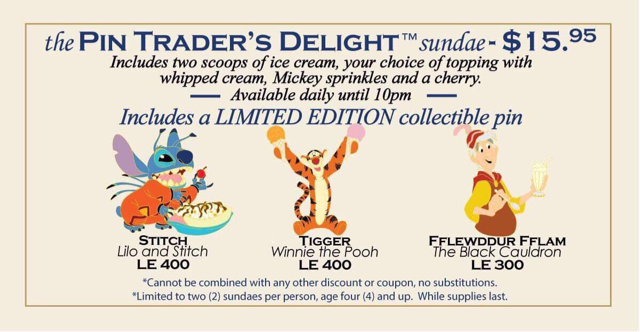 Did enough people buy the third PTD to make it flip during today's release? No one buying it when I was in the store. I would guess not. Has DSSH explained the criteria to make it onto a PTD? Since they also do Muppet PTDs, I assume that Star Wars and Marvel are also possible?